The National Science Foundation (NSF) is sponsoring a workshop to convene 100 graduate students from diverse domains of science and engineering and data scientists from industry and academia to discuss and collaborate on Big Data / Data Science challenges. Graduate students are invited to apply for participation by submitting by June 22, 2015 a white paper (no more than three pages in length) that describes a Big Data / Data Science challenge faced by their scientific or engineering discipline or an idea for a new tool or method addressing a Big Data / Data Science problem. Travel support is available. There’s going to be A LOT of talks and posters to see: choose wisely, make a schedule. One of the first things you should do is open up the abstract booklet with the conference schedule (or download the online version). Make notes of which talks/posters to see and have a schedule for where to be and when. Go to some talks outside of your expertise. Find something that genuinely piques your interest. You never know where you might find inspiration or what you might learn from seeing how work is done outside of your personal research bubble. Bring business cards. Check out Rutgers Visual Identity website for a downloadable template for designing business cards. I got 250 cards printed at Kinko’s for cheap and they look good. Have an elevator speech ready for explaining your research. One of the most common ice breakers when you meet people is, “So what do you do?” Be ready to concisely explain what you do and why it’s important at the level of an educated person who has no idea what you’re talking about. Don’t use jargon. Make it quick; up to 30 seconds is fine and if they want to know more, they’ll ask. Dress nicely. Talk with people who’ve attended the conference before and ask about recommended attire. If in doubt, it doesn’t hurt to directly email the conference organizers. Always air on the side of dressing up than dressing down. You want to make a good impression – you’re probably presenting yourself and your work to almost everyone in your field. Make a summary of your conference experience. After you return home, go through the notes you took during talks and type them up. Reference the papers you meant to look up. Organize the business cards you got and follow-up with people you said you’d contact. Talk to your adviser about your experience and compare notes with any other fellow students who attended too. Try to see the city a little bit. You’re there to go to a conference, but why not plan ahead to see some sites while you’re there during break times? There’s typically group dinners organized at local restaurants, like for a school’s alumni or hosted by a sponsor company – check with your adviser on which ones they recommend you seek out. Maybe you could even extend the trip through the next weekend and do some touring! It made me pause to think for a moment. As graduate students, we get a lot of advice on making the most of conferences, and how to present at conferences, but it’s always assumed that we understand why we go to conferences in the first place. Clearly, for young grad students, this is not always the case, so I decided to make a short list of my top reasons for attending conferences (in no particular order). A big reason for going to conferences is to meet and meet up with people. Conferences bring together people from all different geographical areas who share a common discipline or field, and are a great way to meet new people in your field. At a conference you will be able to get together with people from a wide range of backgrounds or from a number of institutions, whom you may not encounter at your home institution. As you build your professional network, conferences also become a good place for meeting up with people in your field that you haven’t seen in a while. It may not seem like a notable thing, but conferences are also a good way for people to meet you. Yes, you, the lowly second year grad student, presenting for the first time. You may meet someone at a meal, or they may stop by your poster, and within a few minutes, you can make a connection with someone that you might not even have met if you hadn’t attended the conference. This is especially important when you are looking for collaborators, or jobs and postdocs, or, in some fields you may even be looking for committee members. Or perhaps you are just trying to build your professional network. Conferences are another way to get your name and your work out there as you begin to establish yourself in your field of study. This is one of the more obvious reasons for attending conferences: to present your work! It’s good practice in talking about what you do with a variety of people from similar, related and/or completely different areas of study. Presenting will make you more confident about the work that you do, and gives you new perspective about your work as people may ask questions that make you think about your project differently. At a conference you have the opportunity to get feedback on your work from people who have never seen it before and may provide new insight, as well as from people other than your graduate adviser who are experts in your field. As you view different posters or attend different talks, you hear a lot about things in your field that may be new to you. These could be new techniques, new types of equipment, data that is yet unpublished, or investigators that you may not have heard of. Conferences allow you to get a good sense of what’s going on in your discipline that you might not be aware of living in your neck of the woods. You get to hear about the research of some of the biggest names in your field and of some of the newest faces in it. In addition, conferences give you the opportunity to talk to these people one-on-one about what they are working on, and they may even give you advice on how to develop your project. You have the opportunity to ask presenters questions about their work and the rationale behind it, which you can’t do when reading journal articles! This is a two-fold benefit of going to conferences, since not only may you learn things outside your field about other areas of research in your discipline, but conferences also have many sessions for professional development and career advice, particularly at large national conferences. Chances are, when you go to a conference the attendees are united by a single broad topic, such as immunology, but they have many different sub-fields of study, and many projects will be multidisciplinary. Thus you have the opportunity to learn about a different area of your field as a way to develop your dissertation project, for your own personal pursuit of knowledge, or if you are looking to change your research focus. Moreover, conferences (especially the big ones!) have many professional development workshops and seminars for graduate students, where you hear from career professionals about skills such as networking, creating a CV or resume, different types of careers, and interviewing skills. So why go to conferences? I guess a short summary reason would be: for your continued personal and professional development. Take advantage of these opportunities, even if you can only attend smaller local conferences. Meet people. Network. Learn new things. Who knows, you may even end up leaving a conference with a job offer! 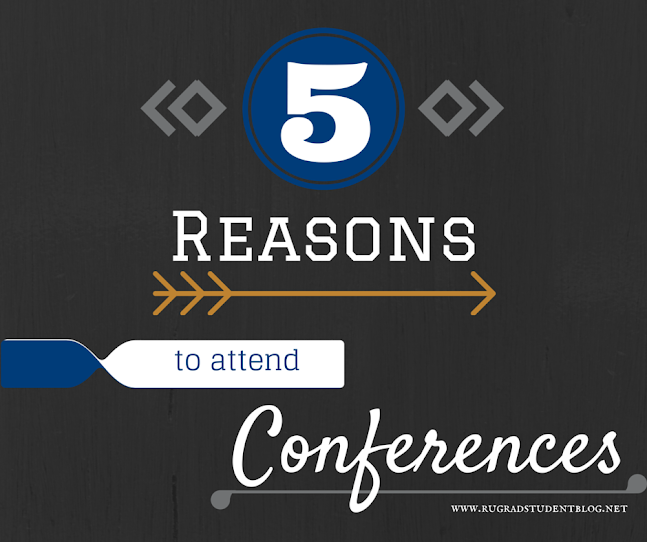 What are some other reasons that you might have for attending a conference? Share them in the comments below! Since I am going to be using 3D printing as part of my research, I’ve been on the lookout for places to print at Rutgers for quite some time. If you’re also interested to do some 3D printing for your research, or you just want to 3D print something for fun, then I have come across a number of options that might be useful for you. I’m sure there might be even more locations available. So, if you happen to know of any other locations that allow for open use of printers, please let me know. Douglass Library, Fordham Commons area Fablab, Douglass Campus: on the ground level of the library are two MakerBot Replicator 2’s and computers with design software. You can schedule an appointment to print your project and to get pricing estimates. Rutgers Makerspace, 35 Berrue Circle, Livingston Campus: MakerBot Replicators and other fun items, like a pool table, are available here. The Makerspace normally has regular drop in hours for printing or just hanging out. The space is run by Rick Andersen who has lots of experience in computers and electronics including web design, Arduino and soldering. Rutgers Mechanical Engineering Dept., Busch Campus: the department has a few options available for Rutgers affiliates to use, including a Stratasys Objet350 Connex and Stratasys uPrint SE. The contact person for setting up an appointment to get your projects printed and for pricing is John Petrowski (petrows@rci.rutgers.edu). FUBAR Labs, Highland Park, NJ: Fair Use Building and Research (FUBAR) Labs is a nonprofit that provides a local spot for people with common interests, usually in science and technology, to meet and collaborate. It’s an open community offering classes, workshops, study groups, and long term project collaboration. You can join as a member for 24/7 use of the space, or you can drop by for one of their events to check them out.